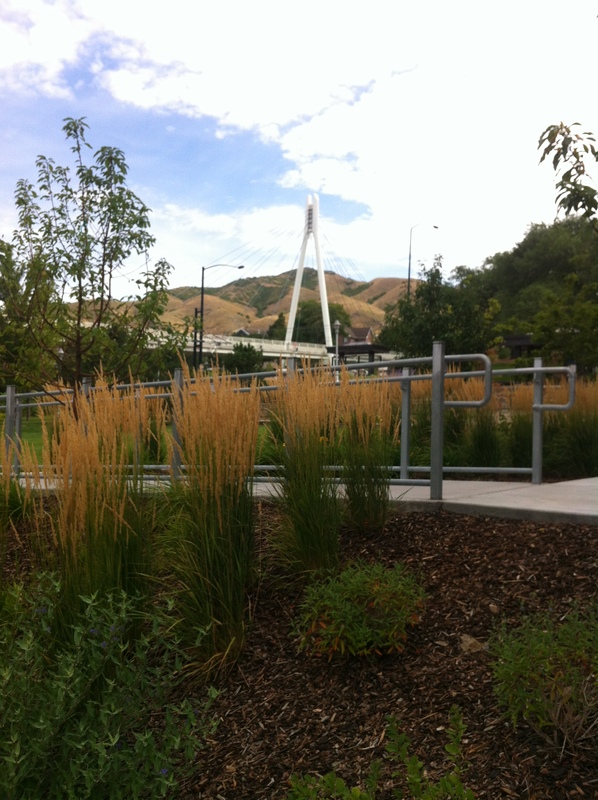 University of Utah campus view. Last night my daughter texted me to say her college was on lockdown. 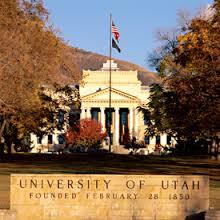 Then, I began getting “alerts” from the University of Utah. It’s one of the worst feelings when you get notifications of a lockdown at your children’s college. Not only did I lose a night’s sleep with worry, but I’m so sad that our kids have to live through this. We never envisioned our kids living through terror-filled nights when we sent them off to college. Other moms I know had an awful night, too, as we waited for news about our kids. We prayed for them to be safe. We commiserated by text and Facebook and I wish the world wasn’t such a scary place. Thankfully, my daughter is safe along with the children of my friends. If you missed the story on the news today, a man with a long history of crime and run-ins with the law was camping with his wife in the canyon above campus. The wife left him for the University to report a domestic dispute. The husband must have followed her because next there was a shooting of Chen Wei Guo, a 23-year-old foreign exchange student from China. In an article in the Salt Lake Tribune, you can learn more details. Can you imagine sending your child to the United States as a foreign exchange student and finding out that he’s been shot and killed? “University of Utah officials, fellow students and friends were coming to grips Tuesday with the Monday night shooting that left a student dead at the mouth of Red Butte Canyon. “ChenWei Guo, of Salt Lake City, would have turned 24 on Sunday. 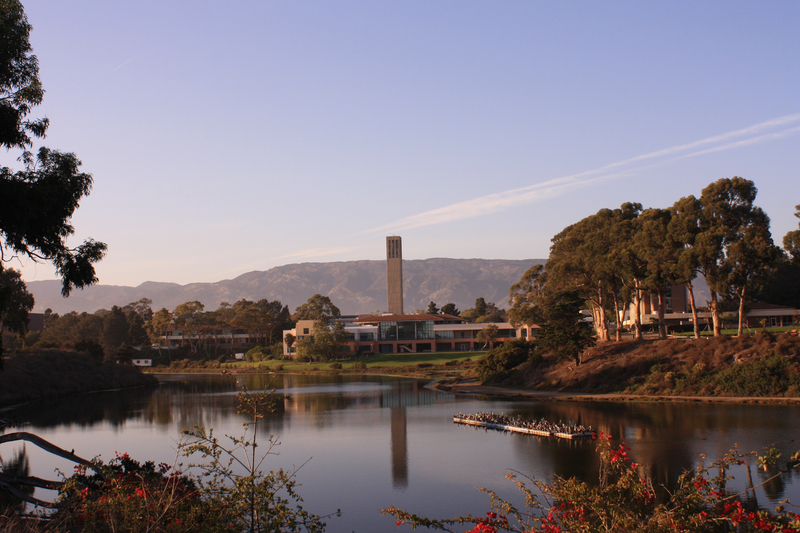 View of the UCSB campus. Friday night, I had tucked myself into bed when the phone rang. It was my son — a student at the University of California, Santa Barbara. This was not a call I was expecting. Nor, one I wanted to receive. A view from a dorm room at UCSB. Friday night the lockdown was because of the shootings and crashing of the BMW. Saturday, the police were removing deceased male roommates who had been stabbed from the killer’s apartment building. l followed the story closely on the news. It’s almost all I could do for most of the weekend. I don’t understand why it happened, or how it could have been prevented. I believe we all tried to find a cause for this horrific tragedy to try and make sense of what had happened when that was impossible. My heart and prayers go to all the families at UCSB. It’s been a tough year. I think the great academic accomplishments of the school are being overshadowed by tragedy. There’s too much trauma for students to digest. I wonder how these events will affect our kids in their future lives? Read about the academic accomplishments of UCSB in the LA Times here. Just a few weeks ago, I got a call from my son during the Deltopia riots. I wrote it about Deltopia here. Add that to the weekly emails about a meningitis outbreak, and it hasn’t been a stellar year for UCSB parents, students, or the faculty. The frantic fear in my son’s voice is not what I envisioned hearing. I am sure this is not isolated at UCSB, but just becoming more common at universities across our country. Is this the new normal for our kids? They aren’t experiencing the carefree college years that we did. Where did that world go? The view of the beach from UCSB campus. Maybe if this is the new norm, as awful as that sounds, we need to be more aware and prepared. I don’t know the answer to any of this, but I’m thinking our kids need to know what to do in the case of an emergency. Are colleges adequately ready to support our kids in times of danger? The alerts let them know when something is going on and does tell them what to do. That’s something that wasn’t around back when I was in college. How would you prepare your kids for emergencies when they’re away from home? Now that your child is in college, be prepared. Roommate drama is a thing. How can parents help–or should we? I experienced drama with my first roommate at the University of Washington. I won’t go into detail, but needless to say it wasn’t a pleasant experience. She was from out-of-state, didn’t know a soul, and after a few fun weeks of acting like besties, we were unable to live with each other. I remember her passive aggressive nature, and I never knew what I had done to offend her. But, she wouldn’t speak to me for days on end. Next, she glommed onto my brother and I watched them as an inseparable couple—except she’d flirt with one particular guy behind his back. We ended that roommate situation after two quarters and never spoke to each other again. My son had a bad situation his freshman year. He and his roommate filled out the computerized roommate pairings at UCSB and they housed together because they had the exact same SAT scores and similar interests. However, the roommate was an hour from his home and girlfriend, had a ton of high school friends with him, and my son just didn’t click or want to get sucked into the continuation of high school life. This weekend, we went to my daughter’s “Parents and Move-In Weekend.” For the second year, she’s living off-campus in a house with three other girls. She has a large, yet cozy room she’s decorated in her own style. But, inevitably there’s roommate trouble from time to time. Whether it’s someone who hoards dishes under their bed, roommates who never do the dishes, or another who’s boyfriend has moved in for 60 days…things will happen between college kids living in close quarters. They are used to having their own space. There’s bound to be tension as they figure out how to be adults, living with new people. As a parent, stay out of it unless it’s a dangerous situation or may result in trouble with the landlord. Give support to your child and let them vent to you. Help them figure out what is the best course of action. Why are they anxious or upset? It may be deeper than what they tell you on the surface. It’s important for your child to not keep things bottled up, but talk things out. Whether it’s talking in person or texting—just make sure they are able to express themselves. Advise your child to think things through before they act. Are they willing to live with the outcome of a roommate confrontation? Or, is it better to let it go? Let your child know that it’s important to stand up for themselves. It’s not okay to be taken advantage of. What roommate problems did you have? How do you help your kids handle roommate drama? On another note, I read in the Seattle Times that the dorms I lived in are being demolished! I’m thankful for my beautiful neighborhood. I’m surprised when people aren’t grateful for all our country has to offer. There is opportunity here for everyone. We have a standard of living that many people from other countries would be thrilled to enjoy. It seems not appreciating our country is especially true for college students. I recently posted a comment on a college student’s FB page — big mistake — when they were bemoaning the problems in our nation. I mentioned something about looking at all we have and being thankful. Guess what happened next? I got a piling on from outraged kids saying that because we have an affluent society doesn’t mean we should be racist. I’m thankful for my kids and friends. Especially the ones who sail! Excuse me? Did I mention anything about racism? Did I say it was okay to be a racist? Let’s be clear. Racism is bad. It’s evil. It’s wrong. But, what I was thinking about is the fact we can choose which path to take. We aren’t forced into a job, career or marriage. We have choices. We also have clean water and air. These kids sitting in their exclusive ivory towers on ivy league campuses with the latest iPhones and laptops seem to enjoy ripping about how awful our country is. I read about it in the paper on a daily basis. How would they enjoy living in a part of the world without a toilet or running water? Where they wouldn’t have a grocery store, a Starbucks or cell service? How would they survive? My hope is that they take their idealism and go to a country where life isn’t as easy. I’m sure a lot of places in the world would welcome them and could use their help. Maybe then, they would appreciate what we have. Maybe they will understand and show empathy for the people who came before them, and the changes we have made. No, we aren’t perfect. No person is perfect. But, we are truly blessed. Beautiful UCSB, where my son attends college. I’m very thankful for my family, friends and country. I’m thankful to live in this part of the world, where we aren’t concerned with basic survival. I’m thankful that we have freedom of speech and wish we could have more civil discussions and agree to disagree. With Thanksgiving around the corner, I think it’s a perfect time to reflect on all that we have. I have a beautiful home, two wonderful kids, a loving, kind husband. I’m grateful for my friends, my community and for those who serve our country and have kept us safe. I’m thankful for the times I get to watch my daughter swim. So, how did it go when we said good-bye? We had planned to stay until Sunday. Move-In day had been Thursday. We wanted to be around for a few days in case she needed us. She wanted us there on Thursday, but by Friday — not so much. It began to make sense for us to leave a day early. We didn’t want to hang out and wait to see if she wanted us around. It didn’t make us feel good and we weren’t enjoying ourselves exploring the city that much. We had a long drive ahead of us, too. So we went out for an early morning walk Saturday and talked about how we’d let her know that we felt it was time to leave. 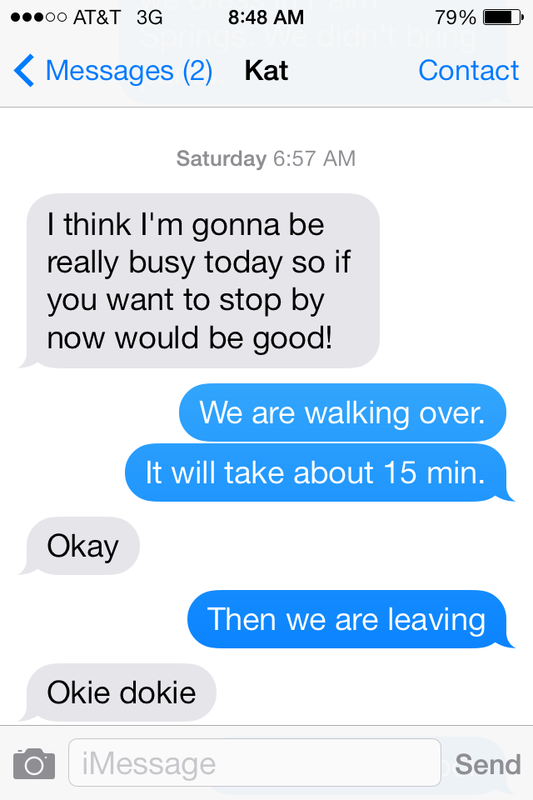 She texted us at 7 a.m. Saturday. It was time to say good-bye. We walked on over to her dorm. I took a deep breath. I said a prayer to be strong. “Do not cry. I can do this,” I repeated in my head. She opened the door, I wanted to say something profound and loving. Something she’d remember — but I said nothing. My husband said a few things and I nodded my head. I opened my mouth, my voice cracked and wavered. At this point I cannot remember what I was trying to say. Tip 1: Make it short and quick. Bill and I walked out of her room into the bright cool air that is Utah. We walked all over campus for two hours and I felt much better — amazed at what a strong beautiful woman we had raised. 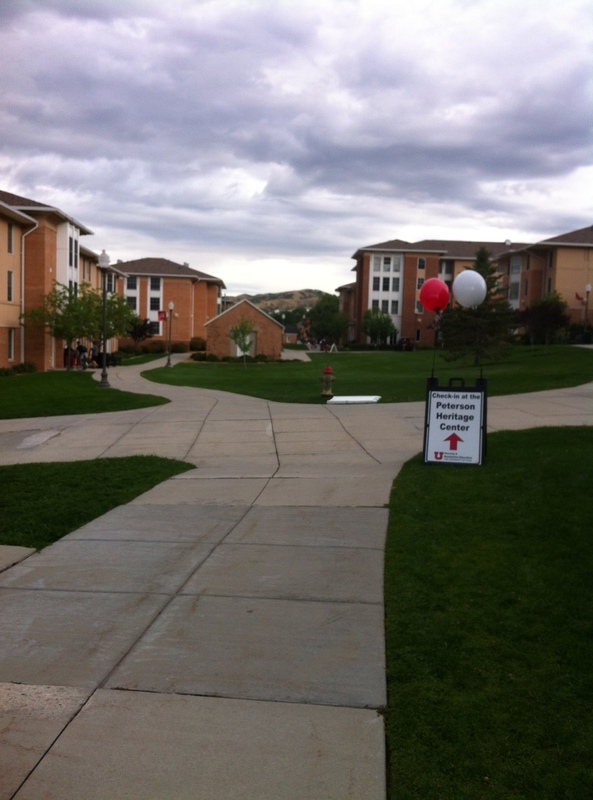 Sage Point dorms at U of U, the athlete housing for Winter Olympics 2002. 7 Tips for Move-In Day for Parents of College Freshman — Or, You Too Will Survive. Move-in day for the parents of college freshman can be overwhelming. 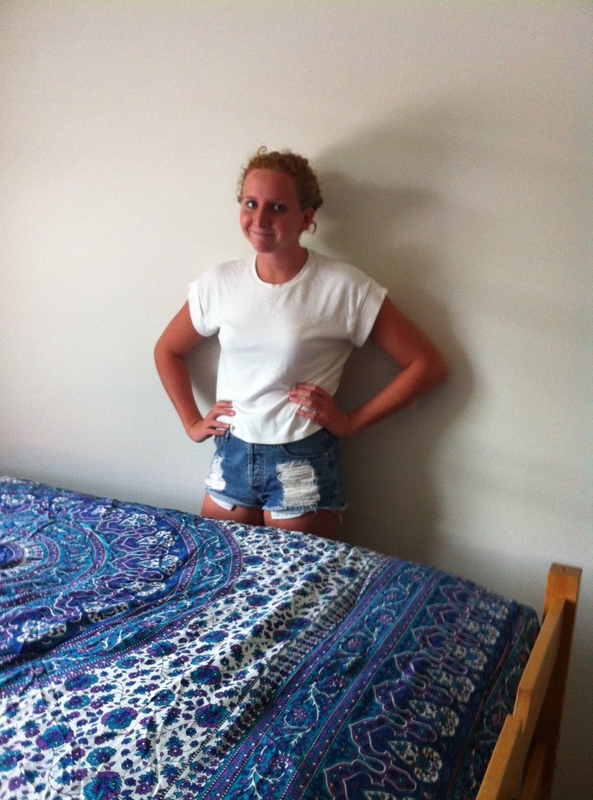 Here are a few tips I wrote when we moved my daughter into her dorm room. 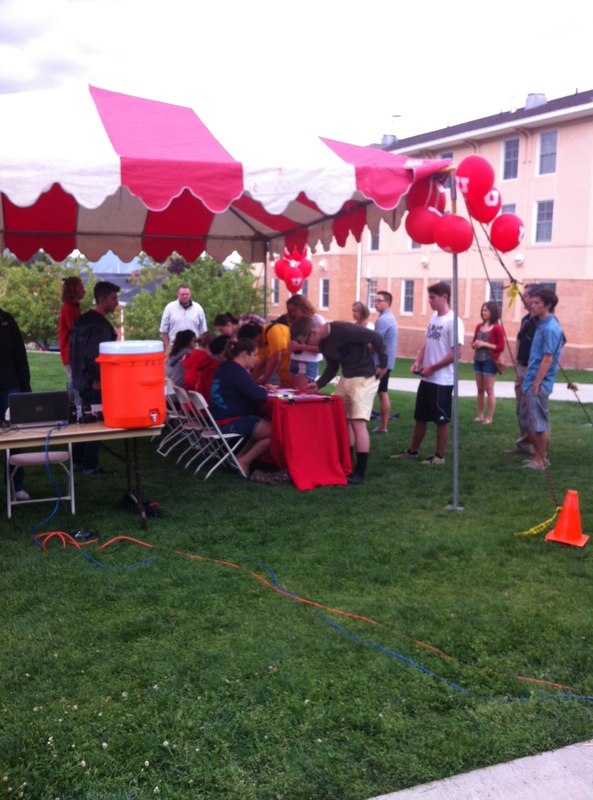 The check-in table at Move-in day. Yesterday was move-in day for our youngest. It was easy to spot check-in with bright red pop-up tents, a field of red carts and dollies, and a line of students ready to help move us in. Not us, but my daughter. It sure felt like us, though. Being 15 minutes early was an excellent idea. There was parking. 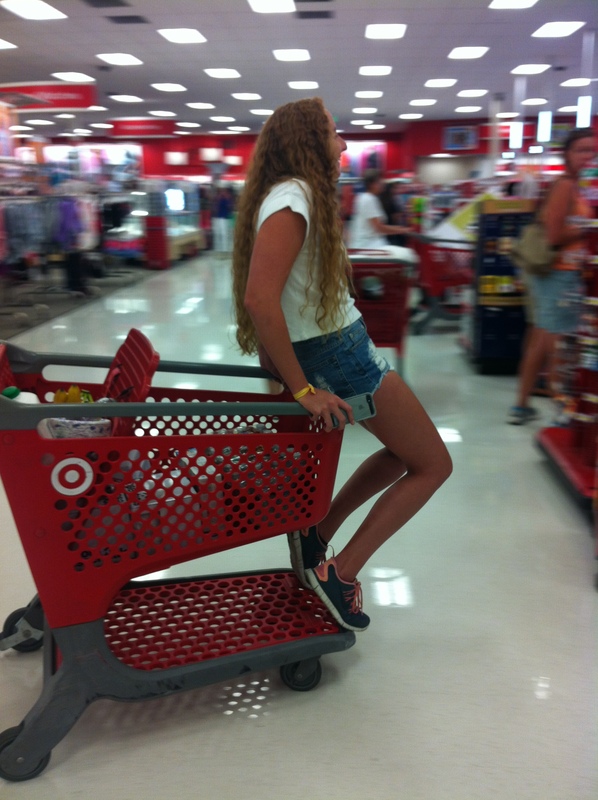 There were carts. There was a small line. Later in the day — parking was in the outer limits — and it was wall-to-wall students and parents making their way to the dorms with car loads of matching “Big Box College-Bound” gear. In her dorm room getting settled. Once in the room, we began lifting bedding, towels and clothing out of the cart. I wondered if I’d be strong, without tears, and how I’d get through the day. 1. Don’t try and unpack for your kid. Don’t try and put things away. This is their space, their new home. They need to make it their own. 2. Don’t hover and stay in their room. Make sure they have what they need and leave them alone. Be sure to be nearby for when they will invariably call. 3. Be prepared to shop multiple times during move-in day. We made one trip to Bed, Bath and Beyond, Home Depot and Costco — and five to Target. This was after we drove a packed-to-the-hilt Sequoia through four states with everything she needed. 4. Make lists. The large stores have lists for your student to make shopping easier. Of course, they have way more things on their lists than you actually need, but it’s a good starting point. Make your own list with the store’s list as a guide. After you move in your freshman’s things, you’ll discover what you didn’t think about or forgot — like strips to hang up pictures and art. Revise and rewrite your list as the day goes on. 5. Don’t try to stay up with the roomie. Some roommates will come equipped with flat screen TVs, $1,000 bikes, and the best and latest technology. Don’t worry about what they have and you do not. In a dorm room, keep remembering the mantra — LESS IS MORE! 6. Don’t go out and buy a router for the dorm’s WiFi until you read the section on technology on the college’s website. Most likely routers are not allowed and it’s a simple passcode that is needed instead. 7. Feed your student. He or she may be so intent on getting unpacked and settled and meeting dorm mates, that he or she won’t take time to eat. Make sure to stock bananas, apples, yogurt and other healthy snacks in their room and fridge. 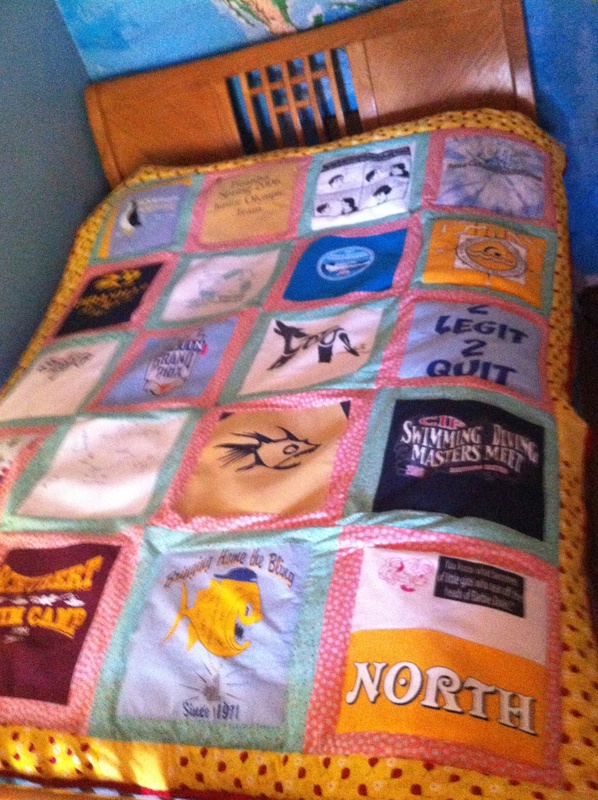 The swim tee shirt quilt I made for my daughter’s dorm room. Years of memories. I made it through the day without tears — mostly. It was a long, busy and tiring day. When my husband and I stopped for lunch — alone — and I realized that we were truly alone — the tears ran down my cheeks. I wiped them off and prepared myself for battle for the next stop at Target. When it’s time to say good-bye — well, I’ll tell you how that goes. You can read about how I said goodbye here. Here’s a song “Teach Your Children Well” that fits my mood today. Listen and enjoy!